Apply Bio-Max+ once per week. For initial treatment of a new pond, double the application to seed pond quickly. If a problem arises between routine applications, apply Bio-Max+ at the prescribed rate per gallon above up to every 3 days until pond becomes clear. 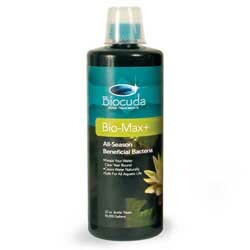 For best results apply Bio-Max+ directly into filter if possible or apply directly to the pond in an area of the greatest circulation.